King Alexander I of Yugoslavia was assassinated on October 9, 1934. His son, Peter, was only 11 at the time, so Alexander’s brother Paul became the regent of the nation, the de facto monarch who held the throne until Peter came of age. On March 25, 1941, despite the fact that then 17-year-old Peter held strong anti-Nazi beliefs, Paul and the Yugoslavian parliament decided that Yugoslavia would sign the Tripartite Pact, aligning with the Axis powers. In response, Peter’s supporters declared he was of age to lead, and the newly-ordained Peter II led a British-supported coup of the Yugoslavian government. The coup failed and Peter fled to London, where he and his government-in-exile found refuge — Britain’s King George VI was Peter’s godfather. Soon after, Peter met Princess Alexandra of Greece, and the two were married in early 1944, with her becoming Queen Alexandra of Yugoslavia. 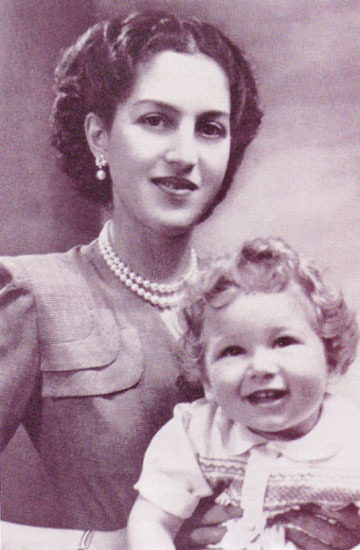 The two had a son (pictured with Alexandra below) a year or so later, but the new Royal Family’s time in power was short-lived — after World War II, Yugoslavia’s new communist-led government deposed them — and mostly one in exile. Mostly, because for one day — and one day only — Queen Alexandra entered Yugoslavia. Actually, “entered” may be an overstatement, as it implies that she had to actually cross a border. In reality, she didn’t even have to get out of bed, and, more accurately, Yugoslavia simply surrounded her. Alexandra went into labor with the couple’s only son, Alexander, on July 17, 1945, while staying at Claridge’s Hotel in London. British Prime Minister Winston Churchill wished that that the baby could be born in Yugoslavia so that the potentially future king could claim to be citizen born there. That, of course, was impossible — Yugoslavia was still the battleground for a lot of fighting (although the Yugoslavian front had mostly quieted) and was under Soviet control. So Churchill did the second best thing — he declared that Alexandra’s suite, number 212, was part of Yugoslavia for the day. Most likely, Alexandra never stepped foot in Yugoslavia proper. She and her husband unofficially separated in the late 1940s and he filed for divorce in 1953; the pair never reconciled. She passed away in 1993, just after the dissolution of Yugoslavia, and was buried in Greece. However, she did, in some sense, return to the seat of her throne. In the spring of 2013, she was re-interred in Serbia as part of a state funeral for her, her husband, and her mother-in-law. Bonus Fact: Temporarily ceding control of a room to another country so that a royal can be born there is, amazingly, something that’s happened more than once. In 1940, the Dutch royals fled to Canada after the Nazis invaded the Netherlands, and in 1943, Princess Margriet Francisca was born at a hospital in Ottawa. Canada declared that the hospital ward she was about to be born in was not part of Canada, thereby making sure that Princess Margriet was not made a Canadian citizen. (Under Dutch law, she was still born a citizen of the Netherlands, as that is passed down by virtue of one’s bloodline.) Margriet is one of the few people to be born on land yet not in an area claimed by one of the Earth’s many nations. From the Archives: Wine and Cheese with the Queen: How to meet the Queen of England. Related: “The Impossible Country: A Journey Through the Last Days of Yugoslavia” by Brian Hall. 4.6 stars on 13 reviews.